FILE - DJ Snake performs at the 2015 Coachella Music and Arts Festival. In this week's Top Five Countdown we’re celebrating the five most popular songs in the Billboard Hot 100 Pop singles chart, for the week ending September 12, 2015. What’s this at number one? Can it be…a new champion? Well, yes it is! That’s still to come…for now let’s begin at the beginning. Major Lazer and DJ Snake slip a slot to fifth place with “Lean On,” featuring MO. I like this song and I am not alone…"Lean On" truly was the song of the season in the Northern Hemisphere: Spotify says it was the most-streamed global track of the summer. 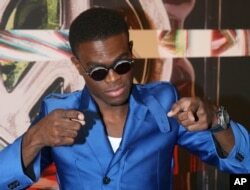 OMI ranked second on the global list with “Cheerleader.”. The Weeknd takes over fourth place with “The Hills,” which has gone double platinum in the U.S., meaning it’s sold two million copies. It also ranks second on Spotify’s list of the summer’s most-streamed songs here in the United States. Guess who holds first place? Yes, the Weeknd…more on him later. 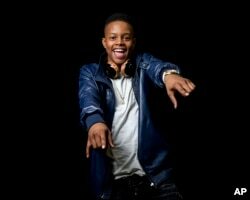 Silento dances in place this week, as “Watch Me” stays put at number three. The Atlanta, Georgia teen is part of the “Scream Tour,” launching September 11 in Sunrise, Florida and extending through October 11. He’s part of a lengthy lineup which also includes Rich Homie Quan, Anthony Lewis, and T-Wayne. OMI arrives at the MTV Video Music Awards at the Microsoft Theater on Aug. 30, 2015, in Los Angeles. OMI has lost and regained the Hot 100 title before…can he do it again? We’ll find out, because “Cheerleader” this week gets pushed to second place. This song has propelled the Jamaican singer to international stardom, but let’s not forget the man behind the music. Producer Felix Jaehn is drawing praise for his remixing skills. None other than Ed Sheeran and Eurodisco king Giorgio Moroder want to work with the 20-year-old German native. This week’s chart belongs to one man: Abel Tesfaye, also known as The Weeknd. He re-takes the championship with “Can’t Feel My Face,” and that’s just the beginning: The Canadian singer also captures the latest Billboard pop album title, as Beauty Behind The Madness sells 412,000 equivalent album units in its first week. It’s the second-best opening week of the year, behind Drake’s EP If You’re Reading This It’s Too Late. It’s never too late to hear The Hits – just join us next week for an all-new lineup.